Vision Concepts, a marketing agency specializing in the beverage industry, announced today plans to expand their unique brand development program. Since its roll out to Hoosier breweries in 2015, the company has found success with the branding program which amortizes the cost of marketing and creative work over a negotiated number of years by placing a flat fee on each case of product sold. That means, companies only pay for work when they sell product. No large initial investment. No upfront cost. Services included in the program are vast and include but are not limited to: brand development, package design, digital and social media and public relations. 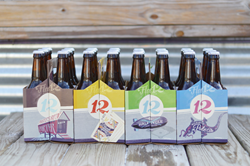 Hoosier brewery, Flat 12 Bierworks, was among the first to sign on to the program..
“Our new branding is not only more representative of us as company, Vision Concepts created visual identities for our beers that feel modern and fresh, while still embracing Flat12’s heritage, community involvement and Indianapolis roots. The new design is sleek, consistent, and catching— the packaging pops off the shelf and customers are taking notice,” says Sean O’Connor, President and Founder. Two other breweries, Noble Order Brewing and Powerhouse Brewing Company, are included in the program and currently going through complete brand development. Garden Party Botanical Hard Sodas signed with the company in Q1 of 2016. These businesses have already seen success and heightened consumer recognition. “We want to see our clients succeed and even exceed our projections. When that occurs, they make more money and in turn, we make more money. It’s a win-win situation where we have a special interest in the brand. It’s not your run of the mill agency. It’s a true partnership,” said Brown. Now, in 2016, Vision Concept is opening the program up to more breweries, wineries and distilleries. It’s geared toward currently operating start-ups who wish to transition from draft-only to package or would like a complete re-brand of their existing draft and package design. Standard services and special campaigns can be tailored to fit any brewery, however. “We are looking for long-term partnerships with beverage industry companies that are as passionate about their products as we are building successful brands. At the end of the day, the beer has to be high quality to achieve success in the market. Quality throughout all elements is an equation for success,” said Brown. For additional information on the brand development program or Vision Concepts, please contact Amanda Fruland at media at vision-concept dot com or visit http://www.vision-concepts.com.